Unlikely to qualify for the Champions League and surrendering their title defence to Manchester City several months ago, Chelsea’s 2017/18 campaign essentially rests on their FA Cup semi-final clash with Southampton on Sunday. Win, and Antonio Conte still has a chance of glossing over an underwhelming season with a second trophy in two years; lose to the relegation-threatened Saints and for all intents and purposes, Chelsea’s term is over. Indeed, Sunday’s 3pm kickoff will go a long way to defining the west London club’s season, and their Italian gaffer still has one obvious decision to make in regards to his team selection – who to start at the tip of the attack. 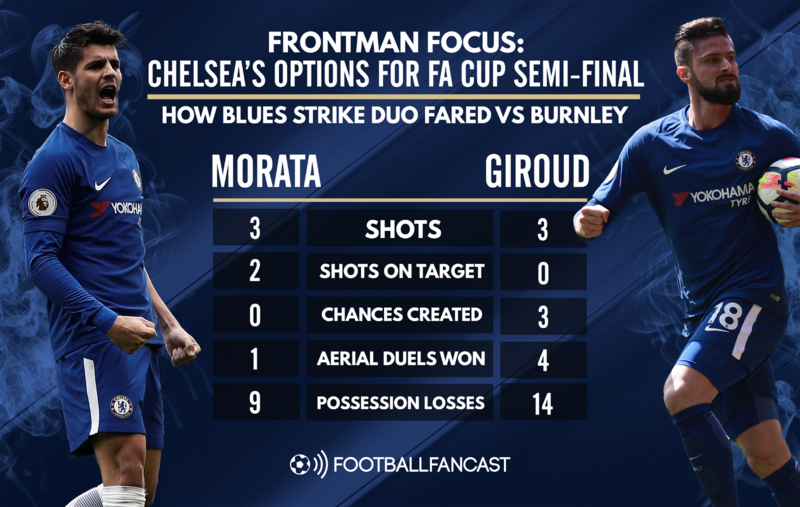 That dilemma essentially made Chelsea’s Premier League clash with Burnley on Thursday a straight-up shootout between Conte’s two options, club-record signing Alvaro Morata and January reinforcement Olivier Giroud, who unexpectedly played alongside each other in a slight re-jig of the Blues’ usual 3-4-3 setup. “I think that Alvaro must be angry because when you have a chance to score, you have to score. Especially for a striker, because a lot of time if you can score, it changes your confidence. With neither actually finding the net at Turf Moor, their most memorable moment was the 23-cap Spain international’s glaring miss in the 52nd minute, when he’d left the defence for dead and appeared to tuck his shot under Nick Pope but somehow curled it around the post. Morata was infuriated with himself after being subbed off, caught on camera slamming a water bottle and his shin pads into the ground, but Conte insisted he was pleased with the striker’s overall performance and in fairness, he was Chelsea’s most consistent goal threat – twice testing Pope and creating that huge chance for himself on the counter-attack. But Giroud, who Transfermarkt value at £18million, will feel he enjoyed the better game, particularly in terms of bringing those around him into play which will be crucial on Sunday when Chelsea will likely return to having two attacking midfielders either side of a single centre-forward. The France international actually made the joint-most chances of any Chelsea player, three, and won the second-most aerial duels after Gary Cahill, four, highlighting the foothold he can offer the Blues in the final third. His shooting was a little more wayward than Morata’s, however, failing to hit the target from his three efforts, and he was slightly sloppier in possession.